Rabbit hutch: Outback Special Hutch with Run. Comfy rabbit hutch with a large integrated run directly underneath the hutch. Ideal for keeping pet rabbits outdoors. Easy assembly. The Rabbit Hutch Outback Special is a convenient and comfortable two-storied outdoor home for your pet bunny. The top consists of a wooden den as a sleeping place and retreat and the actual hutch. Both can be accessed through doors at the front. A drawer with integrated plastic tray that reaches across the whole width of the hutch makes cleaning really easy. 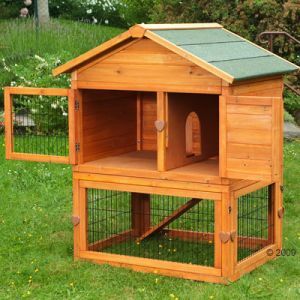 A lockable hatch with ramp connects the rabbit hutch with the run, so you can decide whether your pet rabbit should stay in the hutch, or if it can use both levels. The hutch sits on four wooden feet that are covered in plastic to protect from damp ground. The Outback Special hutch can be combined with an additional Outback Special runs for more outdoor space. The two parts can be connected through a door at the front of the lower hutch part. The additional run is a robust construction of wood and wire. It is completely covered by a mesh roof to protect your pet rabbits from predators and prevent them from escaping. It features four doors, to make taking rabbits out really easy. The run can be used on its own or in combination with the hutch.